mine skips in body fusion.... bought it new. Any out there with same issue? Discogs currently lists 16 releases which feature "Body Fusion" and barely anything else. You are forgiven if you think that Starvue is all about that Rare Groove anthem and that this album might be a one tracker, but that couldn't be further from the ruth. This is a totally solid release. This Japanese reissue CD starts with a quality soul ballad "Let's Hold On To What We've Got" which is marked as Previous Unreleased. Great archive digging! The album's title track "Upward Bound" is a good mid-tempo track which for me starts to really burn after the verses: Some solid repetitive horn licks and the "we can take you higher" chants make this a catchy tune. "Love Affair" made me reach for the cover to check whether there is a Cameo connection. Unfortunately the entire booklet is in Japanese, so I am not sure whether there is any comment on it. It was featured on Zaf's 2015 "Private Wax Volume Two" but I do not remember his liner notes comments. Top quality Funk in any case. Next up is the TUNE everybody knows; "Body Fusion". Nothing to add. 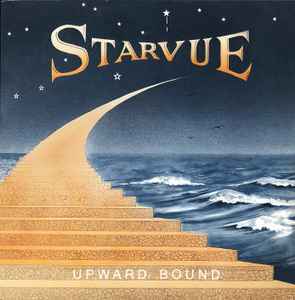 "Starvue" would have been a high speed jam to open their live shows I imagine. "Put The BS Aside" is a good mid tempo groover that was included on a French bootleg compilation. "Love Struck" is a monotonous stomper which could have been big if this album had seen better availability and distribution back in the 80s. "You And Me" would been a quality track worthy to be on many other 80s albums but in comparison to the rest of this album it's in my opinion the weakest. Overall, as I said, this is a totally solid release and I have no idea why nobody in the US or Europe has sorted out the rights to give this a CD reissue. Worth every penny that you will have to spend for this Japanese reissue. It amazes me is that none of the musicians in Starvue seem to have surfaced anywhere else. What an unbelievable waste of talent! Who can tell the story of this band? RE-Birth of this cult LP began in London's rare groove scene during the late 80's. SOMETIMES PEOPLE EMAIL ASKING ME TO VERIFY WHETHER THE STARVUE ALBUM THEY HAVE IS A GENUINE 1st Pressing. The Cat# of a GENUINE 1st press is MIR-1-1721 these are as rare as hell. Some dealers make the mistake of selling the repress as the original. Visually the artwork and credits are the EXACTLY same. However, beware, Starvue Upward bound LP's with the Cat# MIR-1721 are REISSUES. ALWAYS CHECK the Cat# with the seller if you want the original. Once you receive the record. Examine the sleeve/jacket. Originals are thick card sleeves NOT thin (white on the inside) modern card. The original /1st press vinyl is thick, (the reissue is thin modern vinyl which is shinny and light). The artwork on the original/reissue labels are also identical apart from the Cat#. BTW there's nothing wrong with buying a reissue. The reissue was pressed from original masters using modern technology. Therefore the EQ and sound mastering is far superior over the crackly 1st press originals. Some people think originals are always better.... well not necessarily in this case.....Hope this helps anyone unsure. KNOW YOUR MUSIC!!!!!!! !